I love a good press release. Nailing the balance between being informative as well as injecting a little character into a press release is a skill – a rare one at that. The team at Wirra Wirra (and specifically MD Andrew Kay), however, seem to be able to turn out golden press releases time after time, channeling the wild creativity that founder (of the modern WIrra era) Greg Trott would be proud of. 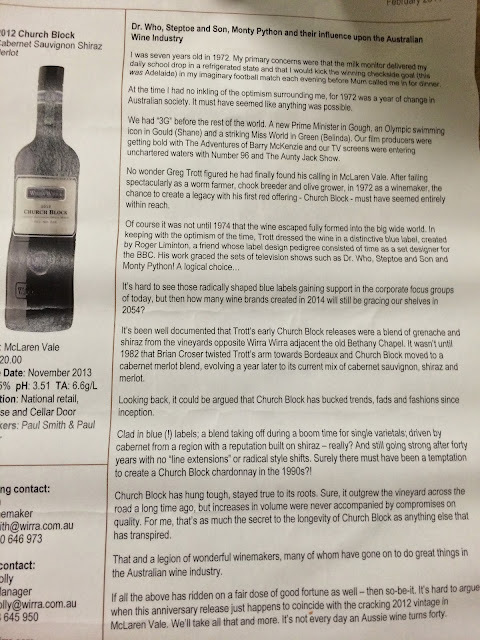 For the perfect example of the typically offbeat Wirra press release approach, look no further than the one below that accompanied this new 40th anniversary edition of the famed Church Block red – inarguably Wirra Wirra’s most well-known wine. As you can see, the joy of such a written piece is the weaving of facts in with story, giving much more of a human context to the somewhat cut and dried world of wine production. Better still, this new Church Block is an excellent budget wine too. Still a Cabernet Shiraz Merlot (the blend changing relatively little over the years) it carries the deep purple colours of 2012 McLaren Vale reds with the nose to match – all coffeed oak, super plush fruit and a slippery choc bullet palate. It’s just a little warm to finish, which obscures the back palate a little, and more broad McLaren Vale red than defined Cabernet, yet the level of concentration and purple/black fruit lusciousness makes this easy to like and very easy to recommend. Unequivocally good rich red wine that will please many. Would I buy it? On your average pub wine list this would be a shining light of quality.